16 • October 2018 www.concreteproducts.com NEWS SCOPE MATERIALS Atlanta-based Boral Resources, the leader in concrete-grade fly ash marketing, has secured U.S. commercialization rights for processing ceramic lightweight aggregate from high carbon residuals generated at coal-fired power stations or impounded at their sites or designated landfills. "This technology offers an opportunity to utilize both high- and lower-quality fly ash resources in the production of a high-value con- struction material," says Boral CM Services Vice President, Technology Rafic Minkara, Ph.D., P.E. "It is ideal for utilizing ash harvested from disposal impoundments that are being closed in response to environ- mental regulations." The technology deploys a proprietary dryer and high-temperature/ high-efficiency rotary kiln to convert raw feed to sintered spherical pellets. The sintering operation is autogenous, as it does not require external fuel aside from the feed material coal. Excess heat produced can be used for hot water or converted into electricity, representing an additional revenue stream. Automated production based on the technology can be overseen by as few as four people. It allows for set up as a) a separate, stand- alone operation to process pond- or landfill-derived material, or b) an integrated installation to be incorporated into a power plant for aggregate production and heat recovery. The process yields a concrete aggregate of ceramic composition, chemically neutral and bearing physical characteristics equating to potentially wider application than natural gravel or stone. The product has bulk density ranging from 35-45 lbs./cu. ft; high strength-to-weight ratio; resistance to fungi, mildew, fire and the effects of freeze-thaw cycles; plus, heat and sound insulation properties. Since 2015, a full-scale production plant in Poland has processed coal ash from a utility landfill as feed material, generating upward of 50,000 metric tons of Light Weight Aggregate (LWA) product annually. The material has been sold domestically and exported for high per- formance concrete. The sintering technology, Boral Resources notes, yields product meeting or conforming to ASTM C330, Standard Spec- ification for Lightweight Aggregates for Structural Concrete; C131, Standard Test Method for Resistance to Degradation of Small-Size Coarse Aggregate by Abrasion and Impact in the Los Angeles Machine; and, C1761, Standard Specification for Lightweight Aggregate for Internal Curing of Concrete. KEYSTONE STATE STOCK Concurrent with LWA processing, Boral Resources has begun har- vesting and marketing high-grade Class F pozzolan from a central Pennsylvania fly ash monofill bearing approximately 2 million tons. The material was produced by a coal-fueled generating station in the 1980s and 1990s, and stored in a covered dry stack on a 30-acre site. Ahead of a marketing plan, the producer tested material samples drawn from boring locations throughout the monofill, evaluating them for chemical composition, carbon content, loss on ignition, particle size distribution, fineness, organic impurities, foam index, and adsorption. Testing indicated the material to be of consis- tently higher quality than current generation ash across a range of criteria. The harvested ash has a higher pozzolanic content than as-produced ash and far lower LOI and sulfur levels. Foam index tests show that the ash's adsorption of air-entraining agents is extremely low—making the material particularly suitable for applications requiring freeze-thaw resistance. Samples also tested negative for organic contaminants. Chemical and physical analyses of a boring composite sample of the ash were also performed to assess it against both the ASTM C618, Standard Specification for Coal Fly Ash and Raw or Calcined Natural Pozzolan for Use in Con- crete and the companion AASHTO M295 specification. The material met or exceeded the requirements of both. The harvested fly ash was found to contain higher levels of alumino-silicates than the as-produced sample and is expected to out- perform current generation ash as a pozzolan. "The Washingtonville project represents a leap forward in providing options for harvesting previously disposed fly ash," says Boral Resources East Region Vice President Terry Peterson. "This strategy will enable increased supplies of high-quality ash for use in concrete. It represents an important new arrow in our quiver of technologies that will be used to supply ash markets affected by closures of coal-fueled power plants." 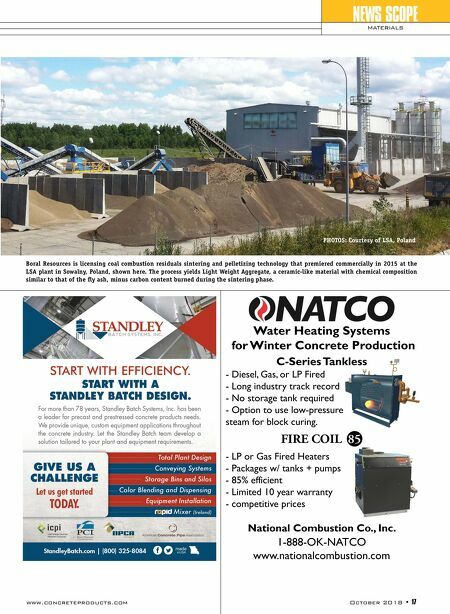 An on-site processing plant dries and beneficiates the harvested ash, the product then tested to assure consistency for use in ready mixed concrete. For lower quality ashes, including those extracted from wet impoundments, Peterson notes, Boral Resources has carbon burn-out technology as an additional harvesting option. In this pro- cess, residual carbon in fly ash is combusted to produce a consistent, low-carbon, concrete-grade pozzolan. Carbon burn-out can also be used to cost-effectively process ash that has been stored for long periods, converting it into a high-quality pozzolan. NATURAL POZZOLAN BLEND Boral Resources has acquired 4.5 million tons of natural pozzolan contained in surface piles at a central Utah mine. 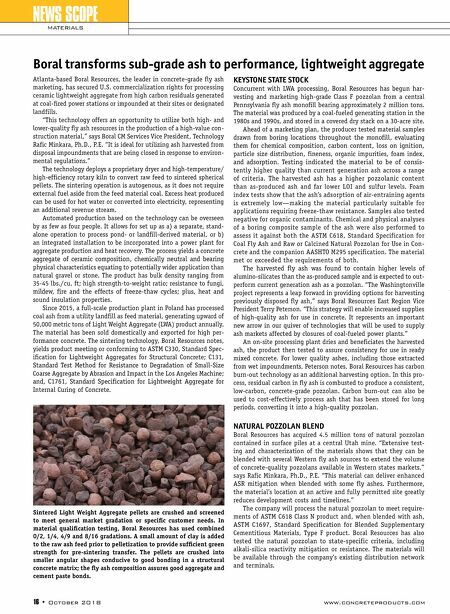 "Extensive test- ing and characterization of the materials shows that they can be blended with several Western fly ash sources to extend the volume of concrete-quality pozzolans available in Western states markets," says Rafic Minkara, Ph.D., P.E. "This material can deliver enhanced ASR mitigation when blended with some fly ashes. Furthermore, the material's location at an active and fully permitted site greatly reduces development costs and timelines." The company will process the natural pozzolan to meet require- ments of ASTM C618 Class N product and, when blended with ash, ASTM C1697, Standard Specification for Blended Supplementary Cementitious Materials, Type F product. Boral Resources has also tested the natural pozzolan to state-specific criteria, including alkali-silica reactivity mitigation or resistance. The materials will be available through the company's existing distribution network and terminals. Boral transforms sub-grade ash to performance, lightweight aggregate Sintered Light Weight Aggregate pellets are crushed and screened to meet general market gradation or specific customer needs. In material qualification testing, Boral Resources has used combined 0/2, 1/4, 4/9 and 8/16 gradations. A small amount of clay is added to the raw ash feed prior to pelletization to provide sufficient green strength for pre-sintering transfer. The pellets are crushed into smaller angular shapes conducive to good bonding in a structural concrete matrix; the fly ash composition assures good aggregate and cement paste bonds.